October 17, 2011 — So let me get this straight. This thing lets you talk to the dead and/or summon demons from dark dimensions…and you buy it at Toys R Us? The world’s a truly awe-inspiring place, after all. And that's how I found myself inside of a dirt pentagram asking questions of those long dead. I have quasi-nostalgia for Ouija boards. Until a few days ago, I’d never used one in my life, but I have fond memories of people in the churches that I grew up in railing against it with fervor, along with backwards-played rock music and the Smurfs. Anything that whiffed of Satanism was shunned because, well, when you believe in the existence of the diabolic, you live your life in terror. Or at least you should. In their defense, this was a pre-Snopes.com era. Trademarked in the fine print. ﻿Of course, this fascination with something that really should have all the mystique of a Magic 8 Ball or a fortune cookie isn’t limited to a religion whose members believe we’re surrounded at all times by invisible hellspawn. 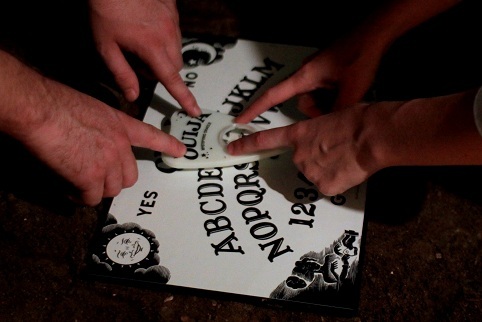 The secular world is into it as well, judging by how often Ouija boards are used as plot devices in horror movies. 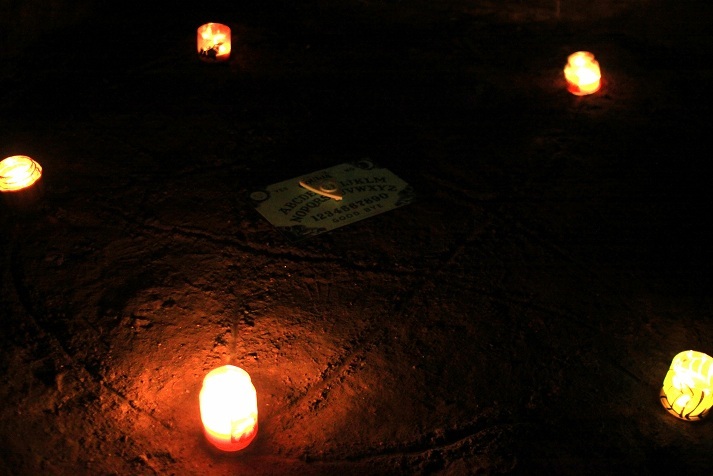 From the epitome of horror that is The Exorcist to relatively recent fare such as Paranormal Activity, the Ouija board has been, well, taken seriously, throughout the horror genre. The strangest thing about this tool of the devil is that it’s a duly registered trademark of Hasbro, the same company that gives us Mr. Potato Head and My Little Pony. Satan himself can’t even release one of these boards without having to put the shoe on the other hoof and signing a contract first. 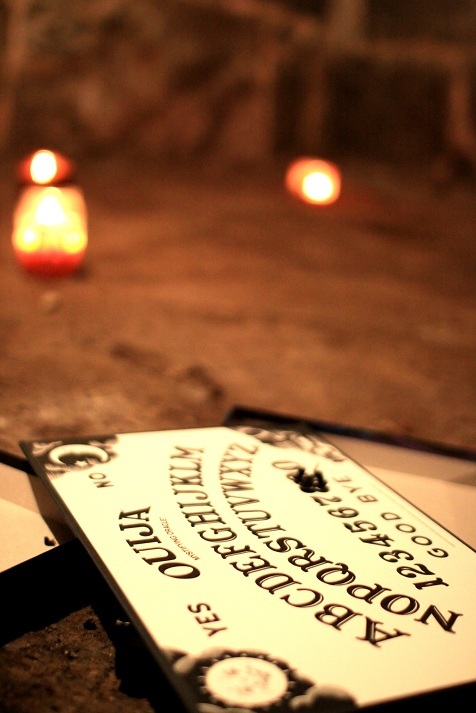 For those of you just getting back from your 200-year space mission to Proxima Centauri, Ouija boards are flat and keyboard-sized, with letters, numbers, and simple responses like “yes” or “no” printed on them. People gather around it and lightly place their fingers on what’s called a planchette, an often heart-shaped flat object with a window in it that can be slid around the board (ostensibly by spirits, but mostly by “that guy,” and perhaps even as a result of the ideomotor effect), pausing on letters to spell words or on the pre-printed responses revealing items about the future, past, or present that apparently only ghosts know. The history of the planchette itself predates the actual board and was using in spirit writing and as a way to make dull parties a bit more palatable. Then, somewhere around 1890, somebody got the idea to put letters and words on a board so that us layman could use the planchette, and then they trademarked it, slapped a nonsense name on the whole thing, and then sold and resold the property until it ended up in the hands of Parker Brothers, which is now owned by Hasbro. And it was for that reason more than anything that I’ve always wanted to try it. The extreme of Satanism and soul peril and the extreme of the toy store board game aisle. Well, this is the Halloween I finally got around to it. For my experiment, I wanted one of those classic-looking boards, the type that looked like it was printed on aged-brown paper as if it had been found hidden in the back of an old portrait or bought only after much cajoling from a long-mustached Asian man in an antique store. However, the only one that my local ‘Rus had was a purple and green-boxed glow-in-the dark version stuck right between Farkle Frenzy and Candy Land. If the color of the box wasn’t enough to do it, the example question for the spirits on the back (“Will I star in my own music video?”) really threw it in my face that I wasn’t a part of the game’s demographic. 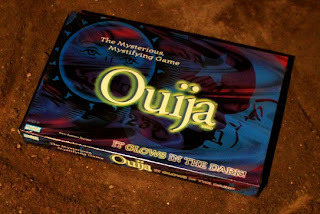 I tried to find a better one online, but they were all super-expensive except for one Buffy the Vampire-themed board that wasn’t even allowed to call itself Ouija. Daggone if I was going to embarrass myself in front of the afterlife with a knock-off board, especially one themed on a WB network television show. Still, seeing it balanced on its edge on a metal shelf covered in clambering children meant that this game is still popular enough to physically stock, 120 years after its invention. Take that, any game whose name has been lost to time. So I bought the glow-in-the-dark version. 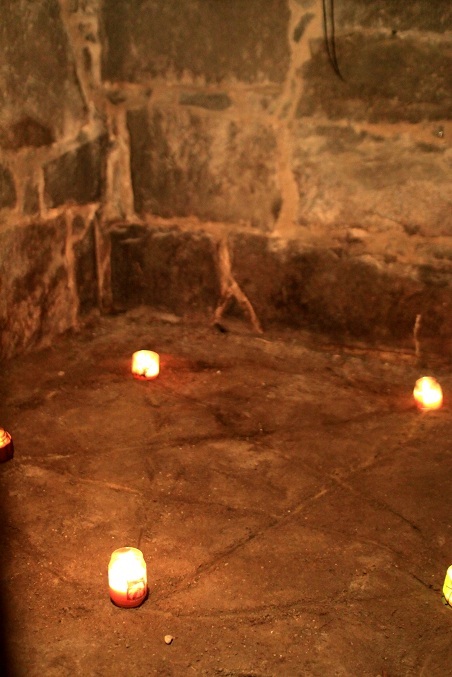 To compensate for that, we picked a spooky place to conduct the Ouija session…our dirt-floored, stone-walled basement that was erected the same year that Ouija was trademarked. Well, I chose the basement. My wife hates it down there and wanted to do it in the living room with the TV blaring King of Queens or anything else that would prevent spirits from dropping by. We waited for night to fall, grabbed candles, drinks, and the board, and then descended to either our doom or disgrace. The chairs from last year’s Cellar Cinema experiment were still down there, so I pushed them out of the way to give me room to draw a large pentagram in the dirt floor with a Halloween costume battle axe. This was mainly for style points, of course, and wasn’t in the directions that came with the board. 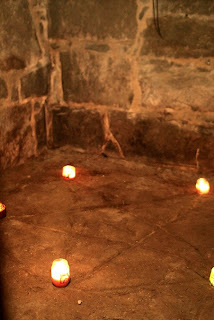 We then stuck the candles on all five points of the pentagram, to both maximize illumination in the otherwise pitch-black basement, and because I’m pretty sure that it’s what you’re supposed to do, except that ours were all Fall-scented candles. Not sure where the Satanic Bible stands on that. From what I remember of Buffy, though, I knew the evil symbol needed to be outlined in either salt or virgin’s blood. We were out of salt and I’m saving my virgin’s blood for a rainier day, so we just made due with clumsily traced dirt lines. We then spent about ten minutes charging the glow-in-the-dark board by holding it near a light bulb. The resulting eerie green glow was strangely satisfying, even if it was slightly drowned out by the pumpkin-spice scented flames of the surrounding candles. 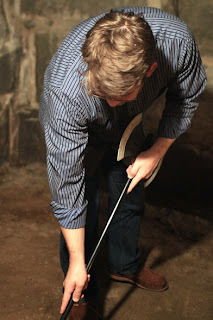 We then settled down into the dirt, careful not to erase any of the lines for fear of letting something into the protection of the circle or escaping out of it into the rest of our house, and then asked our first question. As I mentioned, the house was old enough that we figured it a plausible question. No answer. Not a rafter creak, not a cricket squeak. The directions said to wait 1-5 minutes for a response, and then move on to a different question. However, five minutes is a freaking long time when you’re sitting in a dirt pentagram with your fingers on a glowing piece of plastic. I don’t think we made it that long with any of our questions. The next question we tried was, “Are there any spirits nearby?” to which my wife’s cell phone immediately buzzed upstairs. That just made me feel dumb. It makes sense that if there are ghosts, and they can communicate to the living through inanimate objects, that they would go through an iPhone and not a piece of cardboard sold at a toy store (by the way, it turned out to be somebody trying to get us to refinance our mortgage…much scarier than a demon pissed because his carefully collected souls were AWOL playing board games with the living). We then tried, “Do you have any messages for us?” which made me feel absurdly like I was walking past the desk of a secretary instead of trying to commune with the undead. We tried a few more questions, but after not even a twitch of the planchette, which stuck maddeningly between the S and the T, gave up, conceding that we’d lost the game somehow and went upstairs to pay our mortgage bill or watch King of Queens or something. The history of the game printed inside the box explains that this might happen and not to get discouraged, but consoles you by saying you’ll still have fun. Personally, I don’t know what I was hoping for. Just kidding. Skeleton hands reaching up out of the dirt. But I am going to say this in defense of something that is, well, kind of stupid: Sitting in the darkness and silence staring down at a glowing piece of plastic got somewhat intense at times. And I can understand that feeling compounding with more people…especially for a group whose only other option is to not be the first one to fall asleep lest the rest of the slumber party draws obscenities all over their face. Anyway, if horror movies are any indication, then we have a few days still to see if we unwittingly unleashed anything into our home. I’ll let you guys know. 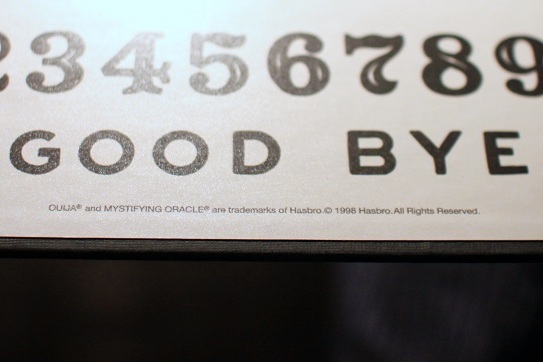 But you might have to use a Ouija board yourself to contact us. LMAO. I can't tell you how much this blog helps me pass my deployment out to sea.